Comprehensive help is built into the app. Just tap the •et; •et; •et; (More) tab and then select Help. Connection to Files via Wi-Fi is only possible when the Remote Access mode is active. 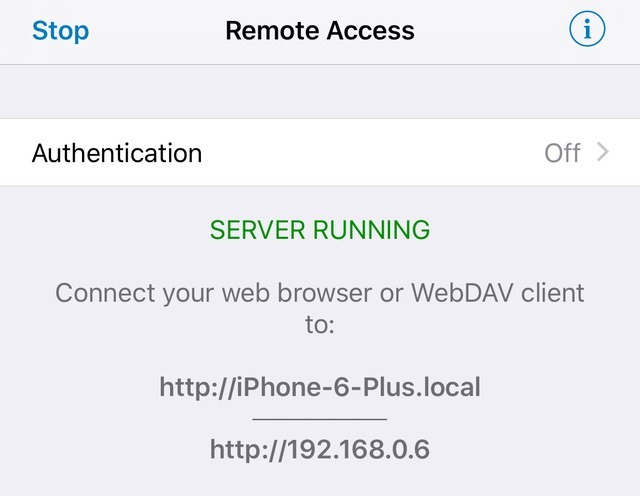 To enter Remote Access mode tap the •et; •et; •et; (More) tab and then select Remote Access. 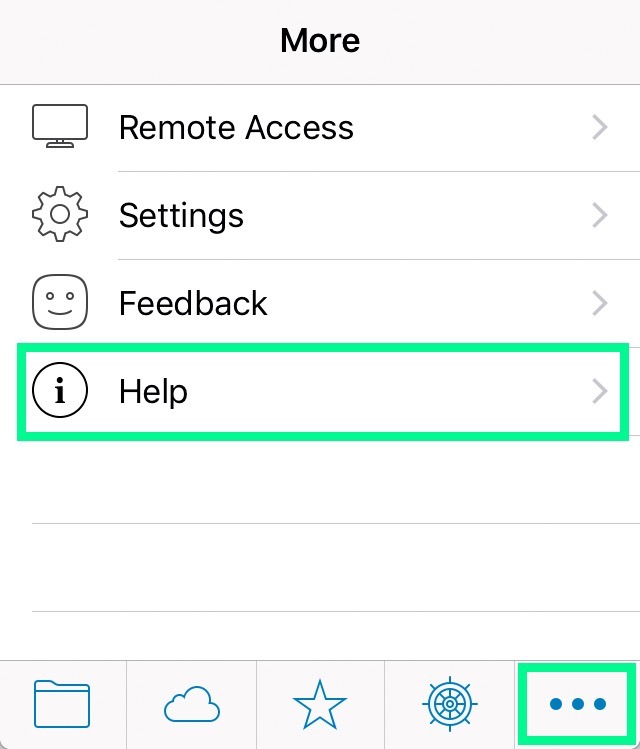 If you're having trouble connecting to Files, in the first instance please check the instructions in the app's built-in help. If you still can't connect then please contact support. Q: How do I delete web browser history? To delete individual items when viewing the browser history use the swipe gesture, then tap the Delete button which appears. When viewing the browser history tap the Clear History button to remove all history items. In the Files' settings, scroll down to Web Browser and tap Privacy. Then tap Clear History. In both cases you'll be asked to confirm the action. Q: Can I password protect files of folders? Yes, you can set a Passcode lock in Files' settings to prevent casual access to the app. Note: This is a Pro feature and requires an in-app purchase in the free version of Files. Q: How do I close a document? iPhone: To display the navigation bar in the document view just tap the screen and the navigation bar will appear. Then click the back button (top-left hand corner) to close the view and return to the previous list of files. iPad: Tap the action button at the top-right of the document toolbar. Choose Close from the popup menu. Alternatively, just tap the selected document in the folder view. Q: Can I delete a file on the device? In the folder view tap the action button on the top toolbar. Tap to select one or more files or folders. Tap the Delete button to delete the selected items. In the folder view swipe a single file to delete it. Tap the action menu button on the toolbar. From the action menu choose Change Text Encoding. Choose a text encoding from the list. By default Files uses UTF-8. If your text document was created on Windows another common encoding to try is ISO-8859-1. Once you've selected an encoding Files will reload the text document using the new encoding. Note that you can set an application-wide default text encoding in Files' settings. It is also possible to add custom text encoding names to the list. Q: How do I upgrade from Files to Files Pro? You can upgrade to the Pro features using an In-App purchase. These purchases can be found in the Files' settings under Upgrades. Q: Why doesn’t QuickSearch appear in the “Open In...” menu in Mail / Safari / another app? Try scrolling down the list of apps in the “Open In...” menu. 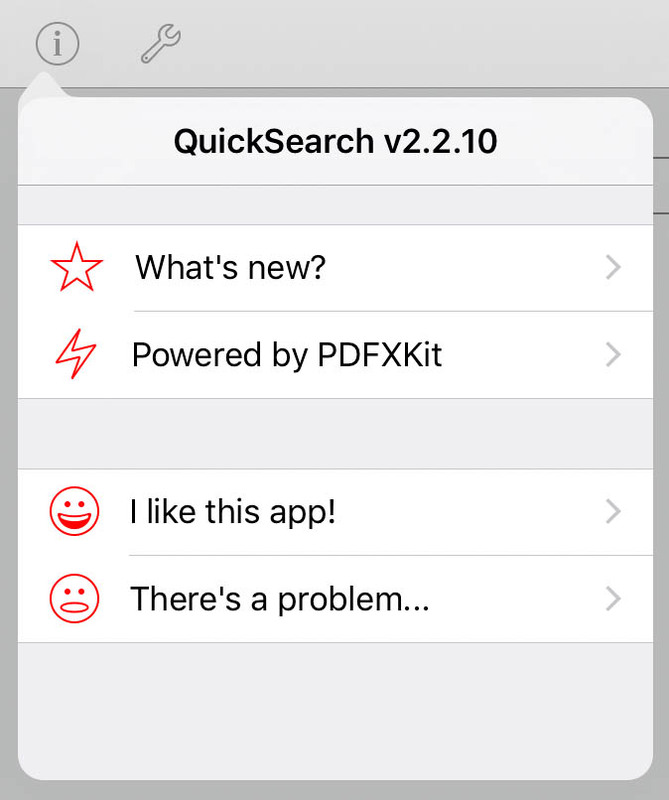 Apple have placed a hard limit of 10 items in this list, so if you have 10 other apps on your iPad or iPhone that can open PDF files, they may be preventing QuickSearch from appearing. Unfortunately the only thing you can do about this is to remove other apps until QuickSearch gets a slot. We’re as frustrated about this as you are: please contact Apple and tell them you’d like them to remove this arbitrary limit. Q: Will you be adding [the feature I want]? Quite possibly, but the more people ask for a feature, the higher priority we’ll give it, so please do get in touch! The easiest way to do this is from within the app under the tools menu in the collection view.